There is a good reason why President Barack Obama described income inequality as “the defining challenge of our time.” The economic struggles of so many families, shrinking opportunity, even shortened lifespans — much of what ails Oregon can be attributed to the vast gap separating the few at the top and the rest. Income inequality in Oregon has been rising for some four decades. It now stands at historic levels. For any elected leader who wishes to make the lives of Oregonians better, shrinking inequality is essential. Unless the fruits of the economy become more broadly shared, the vast majority of Oregonians can look forward to continued stagnation, and worse. In the face of this reality, the very least elected leaders can do is not make matters worse. They should reject laws that pad the bank accounts of the rich at the expense of the rest — laws such as the massively regressive Trump tax plan. The Oregon legislature rejected such a law last month when it enacted Senate Bill 1528. The bill ensures that Oregon severs ties with a new pass-through business tax break enacted by Congress and the Trump administration. Many of these pass-through business owners already take advantage of an Oregon tax break on profits. It’s no mystery who would benefit from the new tax break that would arise without SB 1528. 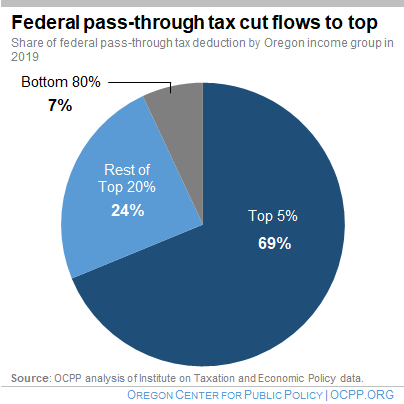 “Oregon Business Tax Breaks Would Mostly Flow To Top Earners,” a recent headline by OPB observed. Indeed, the richest 5 percent of Oregonians would capture the bulk of the tax benefits — one of several key facts the Oregon Center for Public Policy made known as the legislature deliberated on the bill. SB 1528 now sits on the Governor’s desk. Will she sign it or veto it? Vetoing the bill would allow the Trump tax break for rich business owners to become part of Oregon law. It would rob about $1 billion dollars from Oregon schools and essential services over the next five years. And — at a time of historic inequality — it would further enrich the well off. Does Governor Brown take income inequality seriously? We’ll soon find out.